Two teens are forced to murder—maybe each other—in the first in a chilling new series from Neal Shusterman, author of the New York Times bestselling Unwind dystology.A world with no hunger, no disease, no war, no misery: humanity has conquered all those things, and has even conquered death. Now Scythes are the only ones who can end life—and they are commanded to do so, in order to keep the size of the population under control. Citra and Rowan are chosen to apprentice to a scythe—a role that neither wants. These teens must master the “art” of taking life, knowing that the consequence of failure could mean losing their own. Scythe is the first novel of a thrilling new series by National Book Award–winning author Neal Shusterman in which Citra and Rowan learn that a perfect world comes only with a heavy price. Actual review: 4.5 stars I don’t even know where to start with this book! I’m just absolutely amazed at how great this book is. All of the twists (one kinda predictable, but I was so happy when I learned I predicted right!) The character development was amazingly done. I think the author showed the development of both characters very well and how they both when on different spectrums of the Scythe path. The world building was also amazing! There was a perfect amount and I didn’t feel completely overwhelmed with information. The concept was also something I really enjoyed. I study political science and this book was really a very interesting way to see how human beings could potentially end up. Some aspects I would be opposed to, others...I could live without. It also just goes to show that even in a “perfect society” there’s still corruption because that’s just how human beings are. We aren’t meant to be perfect. This is by far one of my favorite books that I've ever read. The take of a utopia instead of a dystopia was refreshing and I felt that I could connect and turly care for all of the protagonists. I 100% recommend this book to everyone who likes a good book. I resisted reading Scythe because I didn't think it could live up to my high expectation after Unwind, but Neal Shusterman has done it again! 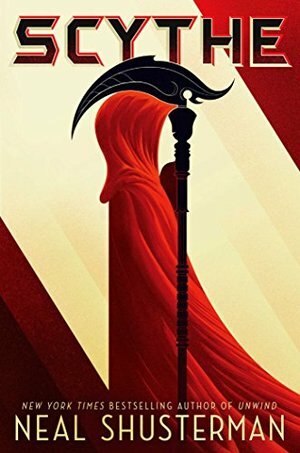 Scythe is a great story of what might ordinarily would be the unimaginable, but Neal Shusterman is a master at convincing the reader that these scenarios could indeed happen in a society like ours given a little more time, along with some continued advancement of technology. I love the political depth within the story as well, but as always with this author, fear not if politics aren't your jam, you will easily read through it and probably miss the indication completely and just take it in as the good story that it is. Natural death, disease and illness are not things humanity has to deal with anymore. We now have nanites in our system that prevent us from feeling pain and if we die, from jumping off a building, we are revived. Unless a scythe comes to your home, at random, to glean you. That is the only way you will meet death because the human population needs to be kept under control. Scythe’s can take an apprentice on to train and teach so that they become the next Scythe. That’s how Citra and Rowan come to meet Scythe Faraday. He brings them both on as apprentices, even though neither of them wants it, but only one will be ordained. As they train and learn about the scythdom they both learn things about themselves and each other. First off, let me say that I went into this book with HIGH expectations and they exceeded those expectations. I can’t believe this book came out two years ago and I’m just now reading it. Thank goodness that Thunderhead is already released so that I can jump right into that one. This book had so many twists and turns that I never saw coming and it was just an amazing experience. As soon as I finished it, I wanted to tell everyone to read it. Right now! I almost immediately loved Citra from the beginning. The book starts with her, her parents and her little brother Ben at home, when a scythe knocks on their door. Now, people are super nice to Scythe’s because Scythe’s have the ability to grant immunity if the person kisses their ring. And they will have immunity for 1 year. So people are nice to them in hopes that they will get immunity. But Citra is so blunt and honest with this Scythe and I loved it! She’s also very caring to her little brother and I love to see a good sibling relationship in stories. Rowan on the other hand wasn’t someone I loved immediately. I didn’t dislike him but he just seemed like an average joe. With death not being a concern (unless you are gleaned) people are living to be hundreds of years old and people are having so many children that they forget about those children and tend not to care. That’s how Rowan is to his family. So when he is chosen to be Scythe Faraday’s apprentice, they could care less. Now Scythe Faraday is amazing! Each Scythe has different methods to how they glean. Scythe Faraday chooses to research his subjects by the mortal statistics. So, if a teenage drunk driver is killed back in the mortal days, Scythe Faraday will choose a teenager, at random, who maybe likes to party. They get this research information from the Thunderhead. The Thunderhead was a little confusing to me. I first pictured it as like the internet but more advanced. Kind of like in the movie Eagle Eye. But then I pictured it more like a god. It is able to communicate with humans except for Scythe’s. The Thunderhead cannot intervene with the scythdom. The story line in this is just phenomenal and I recommend it to everyone. I know a lot of us got into young adult because of dystopians like The Hunger Games, Uglies, The Giver, Divergent and The Maze Runner and a lot of us are kind of over that genre and the appeal of it. But trust me, this one is better than any that I have read. If you don’t trust me, read other reviews on it and you will see just how much it is loved. I always find myself wondering what the hell the human race is gonna do if we keep disallowing natural selection to run its course and instead let all the stupid people in the world to be saved. I adored how Shusterman tackled this problem. I wasn't entirely sure what the plot of the story was gonna be like when I started - just that it had something to do with a person in a grim reaper suit. And boy was I delightfully surprised by how much I truly engaged with the entire concept. The world-building in this book is a big big winner for me. I mean I just want the sequel to understand more of the world more than anything. It is pretty classic dystopia - we have loads of tech; humans aren't really 'developing' anymore, rather we are just 'being'; everyone lives to an age at which they have stopped counting. But the key of the story is how we manage this lifestyle. Because people aren't dying. Instead, we need to deal with the overpopulation. Hence we have Scythes, people whose entire life is now dedicating to culling the population to something reasonable. More than the Sycthedom concept, is the idea of the Thunderhead: basically a big AI cloud that now manages humans in a much better way than humans ever could. No more politics or police forces etc. It's all managed by the Thunderhead. Despite all the books that focus on AI that I've read, I've never come across something quite like this. Hence, I am super keen for the sequel (which is called Thunderhead). Citra and Rowan are the main characters - two adolescents who have been chosen by Scythe Faraday to begin a scythe apprenticeship. They begin a journey where they must confront their own ideas and moral on human life in a world where being mortal is only a historic tale. While I did not mind the MCs, they were not the most engaging characters for me in the book. Understandably, the way they viewed the entire concept of the Scythedom was narrow, compared to their ancient mentors. Overall I found their character development lacking and the romance (?) was unnecessary and very poorly done. For me, however, the other characters made up for this however. Scythe Faraday is an incredibly complex character and forces the MCs and the reader to contemplate many confronting notions of humanity and mortality. Scythe Curie was an absolute gem. Never in a book have I come across a character more elegant, fierce, steadfast, aware, and intelligent as this character. I truly admire the craftsmanship of this character and think everyone should read the book solely to meet her. Even Scythe Goddard is interesting and raises a lot of questions as you get to know more of his thoughts and moral grounds. “I think all young women are cursed with a streak of unrelenting foolishness, and all young men are cursed with a streak of absolute stupidity." At times the story was slower than I typically enjoyed, but I loved the moral questioning in this book so much that it didn't bother me all that much. I adore everything this book offered and can not wait to read the sequel. My biggest question though. Who is wearing the red scythe robe on the cover?